Poor Shane (image courtesy Cricinfo). Gets hit on the head on his birthday and then has to suffer the ignominy of not being allowed to wear those oversized Gucci glasses at his book launch. Wonder if he will still have any luck with the lovely lasses that usually flock to him. You never know, some girls dig the tough/rugged/man of the earth look - so I've heard. PS. 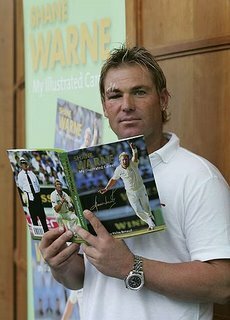 I am dead sure Shane Warne and Steve Waugh would have set some sort of record between themselves for the most number of books published by a cricketer. There seems to be one or two every year. But then again, what would I know. No? Update: You can buy Warnie's new book (the one he is holding in the photo) here.